Alness salmon don’t seem to be too discerning regarding fly pattern, and all of the ‘usual suspects’ for peat-stained water can be successful if river conditions are good i.e. any colour you like as long as it's orange, yellow, red or black, or any combination of these! So patterns to bring include Ally's Shrimp (including yellow and red versions), Cascades, Flamethrower, Willie Gunn, Findhorn Killer, Tummel Shrimp, Red Francis, Temple Dogs etc. Exceptions to this are when the water is coloured during the early hours of a spate, or when carrying leaves in the autumn. In these conditions bright flashy flies and flies in contrasting colours to the leaves are likely to be more successful e.g. Ice Maiden. Of more importance, is having the right sized fly for the conditions, and fishing it at the right depth and speed across the current. Low water generally means small flies, and shrimp patterns should not be too heavily dressed, but don’t rule out tubes; small brass/copper bottle tubes in particular. These can be very effective in deep, fast runs at the heads of some pools. And you can also try flashy, heavy flies, cast into the depths of the deepest pools, and fished with a ‘sink and draw’ retrieve. Anything goes at these levels; doubles and tubes are both effective on floating lines, indeed you may want to change fly type from pool to pool. At the lower end of this range, a 1 inch tube on a floating line or a size 8 double on a fast sink polyleader should be effective, but at higher levels, you may need a polyleader in combination with a brass/copper tube. Even in high water, there is no need to get down to any great depth, just a few inches down can make the difference, and with this set-up, your fly will likely fish progressively deeper as it swings around to your bank. These are also good water levels to try stripping a Collie Dog, Sunray Shadow or Monkey across the pools, the tails in particular if the spate is receding. 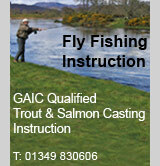 If the water is rising and starting to colour, try a bright silver or gold-bodied fly. At levels just above + 2ft, you can still fish a conventional double on a fast polyleader or sink tip, as long as you have a short leader, but you will do better with a big tube; 1.5 inches is normally sufficient, though you can go bigger especially in late season. If you are struggling to cast a big tube on a sunk polyleader/tip, then try a 1 inch shrimp pattern such as an Ally’s Shrimp or Cascade, which with its long tail has more presence. Below is our virtual fly box, showing the types of flies and patterns effective on the River Alness. If you get the type and size of fly about right, believe in your fly and fish it with confidence, you will fish better and catch more salmon! 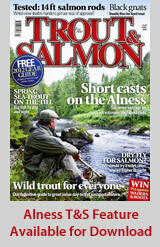 Follow SalmonQuest's River Alness Salmon Flies board on Pinterest.